May was our busiest month in terms of loans completed, with 11 flying off the shelves, with £382,500 advanced, more than double that of April. 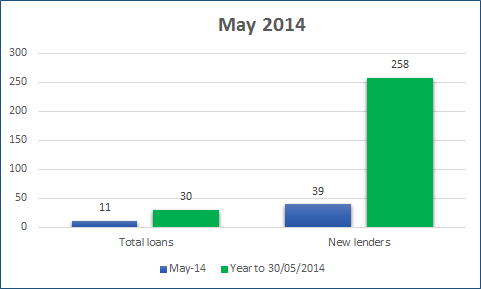 It also means we’ve already done more loans in those five months than in the whole of 2013. 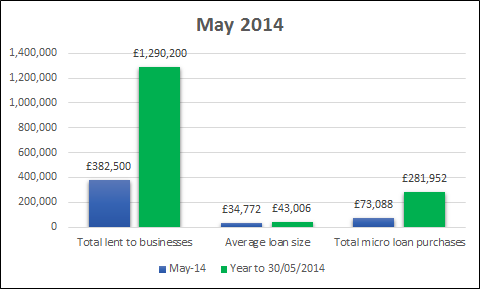 Loan size was smaller than the average throughout 2014, which has pulled the average size down further. Our average in 2014 is now £43,006, £10,000 less than the average size in 2013. This might indicate investor preferences for lots of smaller loans and we’re in a good place to test that theory in June with large requests from GRA Project Management, which has already drawn down two loans with us in the past, and Old Hall Inn and Cottages Ltd.